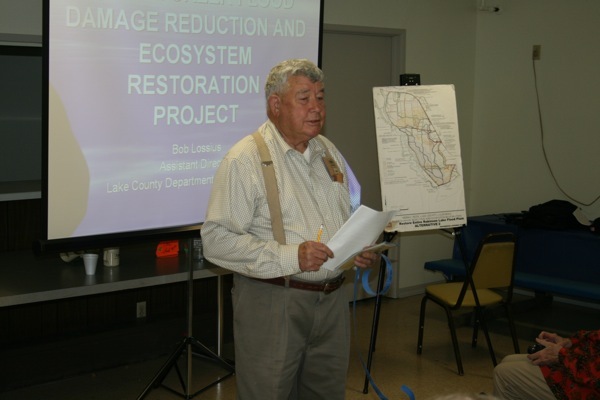 July 27, 2013: Lake County lost one of it’s great “movers and shakers” when Randy Ridgel passed away Friday evening. A lot of people knew of Randy through his countless letters to the editor that generally advanced the conservative point of view, using his sharp wit and humor to make his points. Whether you agreed or disagreed with his opinions, he certainly had a way to advance the discussion and create healthy debate. He was not afraid to speak his mind and defend his beliefs. Although Randy had strong opinions on the way things ought to be, he was first and foremost a traditional American Patriot who was dedicated to God, his family, his country, and his community. Lake County politics will not be the same without Randy. Randy enjoyed telling the story of how he snuck into the navy as an under-aged minor and served around the world in a submarine. He was proud of being called “that crusty old sailor.” He loved telling humorous anecdotes about how he met and married his teenaged bride Jackie, and how she helped formed him into the great man he became. They raised a family, and settled on a ranch near Kelseyville, where they poured their hearts and souls into our community. When he learned about our local Historical Society, he joined and quickly became an active member, including serving over 8 years as it’s president. Randy is the one that had the vision of making the old Ely Stage Stop into a country museum, and he helped assemble the team that ultimately made his vision a reality. He lived long enough to see the Ely Stage Stop develop into Lake County’s newest historic landmark and visitor center. Ely will be his greatest legacy for future generations to remember him by. Decades ago, Lake County acquired one of the few remaining pre-earthquake San Francisco cable cars. For years, it was housed at the Lake County Fair Grounds where kids played on it and it was used as a photo back drop. More recently it was housed by the County where it has been going through renovations. Years ago Randy adopted this project and has been working on getting it placed at some appropriate location so it can be once again enjoyed by our community. Recently his efforts paid off when it was arranged that it would be moved to a permanent location at the Ely Stage Stop. He was looking forward to be on hand when it was to be moved this coming week to it’s new home when he suddenly passed away. Now, when it does get moved, the joy of seeing another one of Randy’s visions for Lake County becoming a reality will be tempered by the sadness of his passing. Much more can (and will) be said in the coming days about Randy, but for now it is suffice to say that our country owes him a debt of gratitude, as does Lake County and it’s Historical Society. Our hearts and prayers go out to Jackie and the Ridgel family. Phil Smoley, President, Lake County Historical Society.